For the friend, colleague or family member that love knives, here are a few nice ones that won’t break the gift budget. 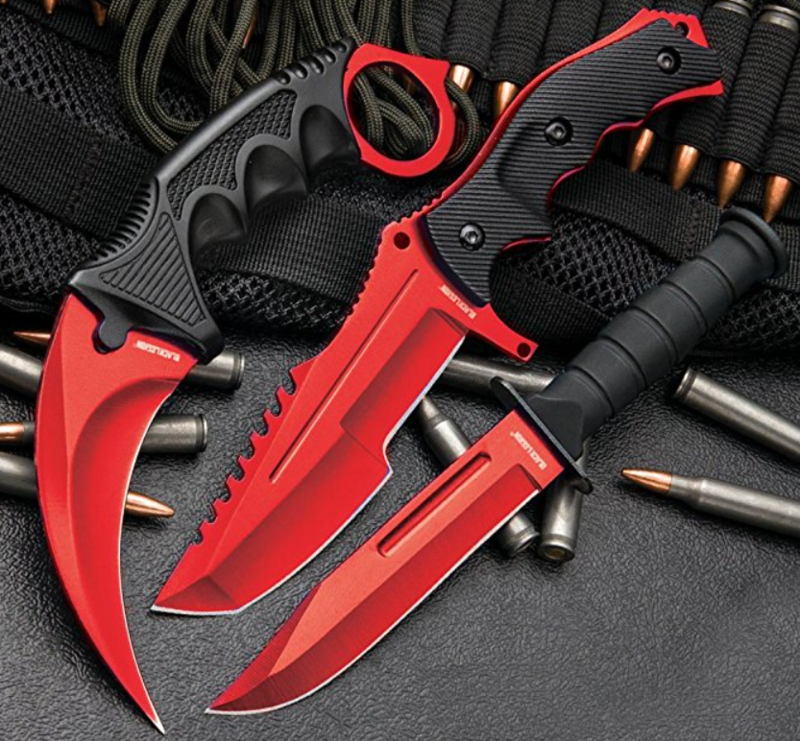 We’ll look at karambit, huntsman, military, pocket and tactical knives in this article. Click here for more info on the knife. This first knife is a great looking, with a nice blue finish, serrated edge near the handle, and a light that is a main feature buyers have enjoyed because of its practical use in situations where a light is needed to see in corners or darker areas more clearly. 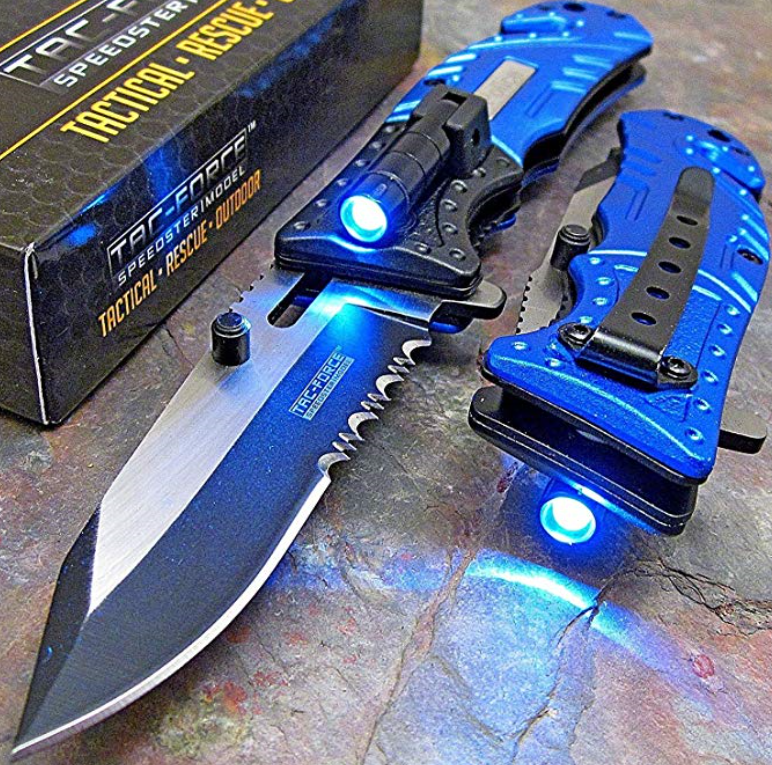 One of the general complaints about the knife was that the included flashlight on the side didn’t work. The major problem in most cases was because users didn’t know how to use it. Part of that was the company’s problem since it didn’t include instructions. It’s really easy though once you know how. First, when you look at the light in the image, take notice of the top. This can be easily unscrewed. When you receive the knife there is a piece of white plastic that blocks the connection between the flashlight and the batteries. All have to do is remove the white material and screw the cap back on, and it’s ready to go. That aside, this is a nice knife at a great price that most people would be glad to be seen with and use. Click here for more info on the knives below. The next gift option for a knife is a set of three. The set includes a karambit, huntsman and military knife. The huntsman has an advertised length of 8 1/2″, while the other two are said to be about 7 1/2″ long. I particularly like the black and metallic red color combination. The black TPU handles provide a secure grip for those holding and using them. Also part of the package is a nylon sheath for each knife. The knives are light. Buyers need to take into consideration the knives, to some people, aren’t quite as large as they thought. Take out a ruler and get an idea of the length of the knives so you’re not caught off guard by their size. For those that like the style and color of these knives, it’s a great deal. Click here for more info on the knife below. 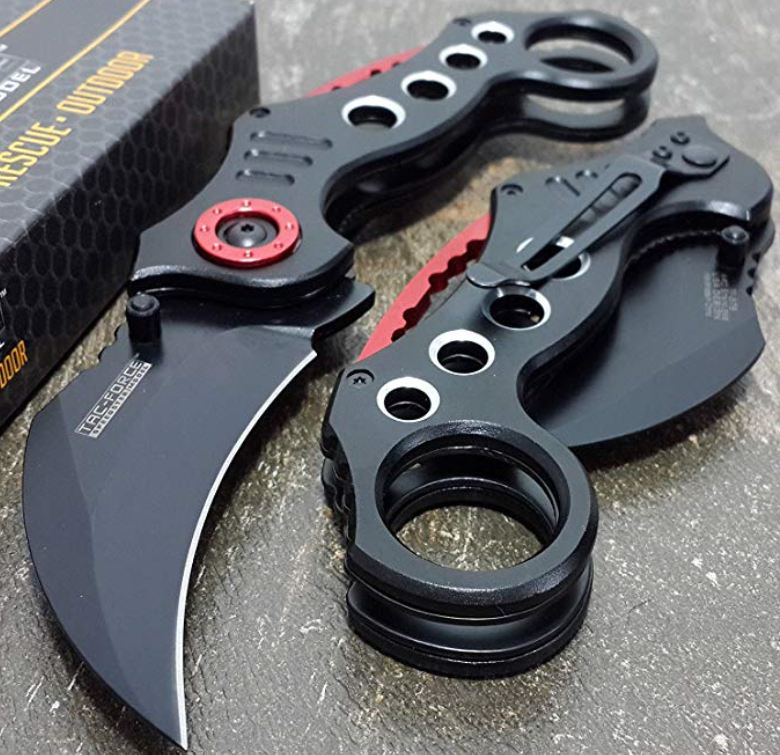 Last but not least by any means is this karambit folding knife. Not only is it cool looking, but it’s definitely a good self-defense option for those that may be in danger at close quarters. The size of the knife blade is 3.25″, with the overall length at 7.75″. It is a sturdy knife that should work well in regard to weight. It’s not real heavy or real light. There is a fell of balanced weight to it. There is a black pocket clip and ring grip, as you can see in the photo. This is a good knife to show off to friends, but if there are times where a person is called on to potentially defend themselves, just having this in your hand could deter someone from trying to harm you. If not, it’s a very potent weapon if your life is in danger. Also interesting and compelling about the performance of the knife is how quickly it opens. It is close to as fast as a switchblade in my opinion. Well there you have it. A nice collection of quality, nice looking, practical knives that can be acquired at a good price. When thinking of family and friends that are attracted to knives, these knives are a good place to start looking.